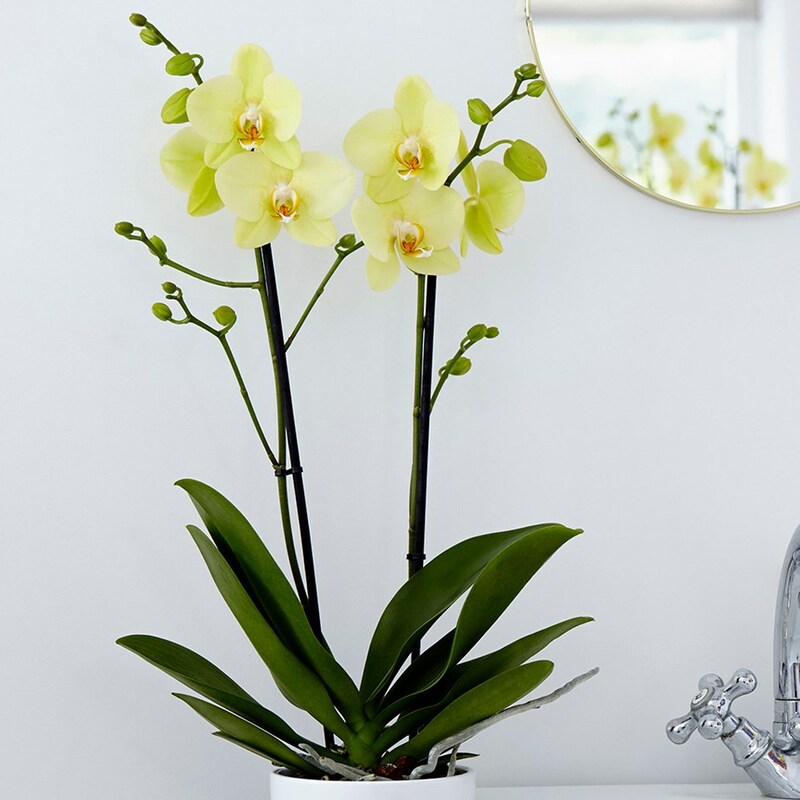 Phalaenopsis or Moth Orchids have become one of the U.K’s most popular houseplants. In my early experience of horticulture orchids were considered collectors plants for the expert and could be vastly expensive. In more recent times much progress has been made with propagation in laboratories, which has led to mass production and therefore a vast reduction in price. 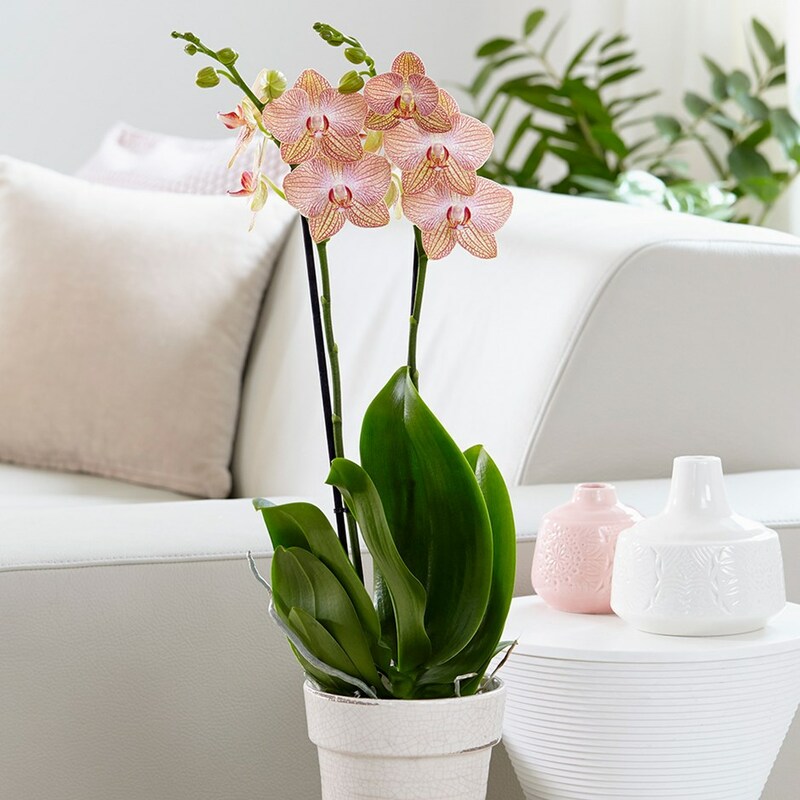 It has also been found that orchids, and in particular Phalaenopsis, are easier to care for than was previously widely thought. In our centrally heated rooms Phalaenopsis can be in flower for a large proportion of the year. Phalaenopsis only grow to a maximum of 1m or 3ft in height and a spread of 30cm or 1ft, and so are easily accommodated on our windowsills. Placing on an east or west facing windowsill ensures good light levels in winter. This will encourage flowering. However this will lead to too much direct sunlight in the summer. In summer a north facing windowsill is ideal. A warm environment is essential to replicate their tropical origins. At night a temperature of 16-19 degrees centigrade or 61-66 degrees Fahrenheit is fine. However a higher day temperature is ideal. This should be around 19-30 degrees centigrade of 66-86 degrees Fahrenheit. Try to place in an area where there are no drafts. With these conditions Phalaenopsis will stay in flower for you for months at a time. Do not worry if roots stray from the pot. In it’s wild conditions these orchids will grow on the side of a tree, without soil. These aerial roots will take up moisture from the air. In our domestic conditions it is easier for the plants to be grown in pots. It is said that Phalaenopsis should be grown in transparent pots so light can reach the roots, and indeed this is how the growers often grow them. This however is contradicted by fact that retailers often supply their orchids in opaque china pot covers. However you may wish to experiment with growing these plants both in or out of a pot cover and see which gives the best results. Some retailers have started to stock transparent pot covers for orchids. After flowering the flower stem should be cut back to just above the second joint or node below the spent flowers. This will help new side shoots to develop and encourage the plant to flower again. Regular watering is necessary, a minimum of once a week. However the plant should never be allowed to sit in water. Standing the plant in a sink or bowl for watering ensures the roots are wetted but any excess water is allowed to drain away before placing back in their normal position. It is undesirable to wet the foliage, except however for the occasional wipe to remove dust and allow light to reach the foliage. Reduce watering slightly in winter. Summer misting can also increase humidity. Regular feeding in the growing season is recommended, but some watering should be carried out without feed to avoid harmful salts building up around the roots. Less feeding is required in winter. Use a specialist orchid feed which is available from many good retailers. Every couple of years it may be necessary to repot the plant into a larger pot. You should always use a specialist orchid compost that will usually contain bark. Repotting should be carried out in spring or early summer. Any damaged roots can be removed. Remaining shoots can be shortened using scissors or secateurs. The new pot will not need to be more than an inch wider than the original pot. A split cane may be needed to support the plant. If treated well, Phalaenopsis are reasonably easy to grow and will give you little cause for concern. Mealybug can be a problem. If this occurs, seek a remedy from your local garden centre. If the plant refuses to flower, a slight reduction in temperature for around four weeks will usually encourage new blooms. Propagation, although possible, is best left to the experts who can provide laboratory conditions. 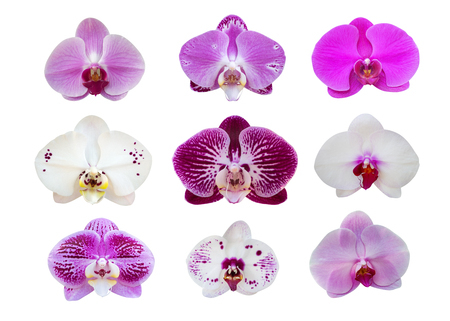 As you can see from the image at the top of the article, modern hybrids of Phalaenopsis come in a myriad of colours. These are easier to grow than the original species. Vast production of these orchids has led to low prices for Phalaenopsis in your local supermarket. Although cheap, these orchids in some cases have not been given the care they need in their early life. They are also almost always unnamed. They are fine for brightening up a dull windowsill, but the more discerning customer may wish to build a collection of named varieties from a specialist nursery that have been cared for by experts. A good selection of named varieties is available below.